@jl08: I can't find an Eng subbed Video Cut where the PD-Nim raved about their chemistry. @bebebisous33 just read the hands and feet analysis.. wow.. you really should get a book or article published on this drama...esp the last part about JH looking at the hands picture.. I never even noticed the pic.. have to watch that scene again..
PS: have you written any other analysis for any other kdrama? Agree. Out of a crew of 200 people in this drama, I'm sure some of them are following this thread. This happened before in one other thread here when the show was airing and he/she gave off hints and some facts (but i was a lurker then) lols. That's why he keeps saying to her that she is a friend. However, I believe that his words must hurt her a lot because she is constantly reminded that in that moment she fell in love with him﻿. I totally understand HI. It would have been life changing for her to confess to JH or not to confess. There is so much at steak if she confesses to JH. So she chose to remain a friend all this time. @bebebisous33Thank you for hand and feet analysis. Your really great. Keep it coming. Hope to the Encounter staff who keeping an eye to this thread KINDLY GIVE US A HAPPY ENDING PLEASE!!! Back to your question. I have... you can find analysis in such lengths in older k-dramas like Cheese in the trap, Strong Woman Do Bong Soon, Moon lovers (check the first page) and Goblin. But I must warn you that I had to delete the pictures I used back then because of the limit of the attachment. In more recent dramas, I wrote quite a lot in Money flower, Let me introduce her and Lawless lawyer. Right now, I am posting less on other threads (see below). As for the analysis about hands and feet, this is definitely not finished. I wrote about HI because this was much shorter. The first episode was the one who had the biggest number of takings with feet and hands... That's why it was so long. Yet, I am determined to do it till the episode 10. The other topic will be the sea. By the way, if you have any request or suggestion, let me know about it. I am open to any suggestion. As i rewatch episode 9, on their brief separation it just occured to me WHAT IF KJH resigned from Donghwa and just kept his distance— Do you think SH will go after him? Are her feelings for him so strong that she will go out of her way just to talk to him? What if he takes her words seriously and just try to think what is best for her by leaving her at peace in order to keep hold of her hotel and all that.. do you think she’ll fall apart if by chance he gives up on all that is left of their relationship? Sorry, it’s just the dramatic side of me that wants to see how far she could go for him.. Here, her high heels embody the chaebol world which is a uncomfortable and painful world. That's why her foot has a wound. She might look good in high heels but with such shoes, it is impossible to walk for long and properly. JH with his hand offers assistance. Striking is the meaning behind the hand, JH has to lower himself but he doesn't mind it at all. The hand reflects two aspects: modesty and kindness. This simple taking has such a deep significance but it marks the start. This is absolutely amazing analysis. Again thank you. I love the way that this drama has drawn us all to focus on these fine points. I hope that Encounter continues to be this conscious of detail until the very last moment--beyond the wonderful and believable romance, it is the attention and care in direction that have made this such a stunning drama. The girl went through a rough marriage with abuse from the mother in law and then a divorce that was messy in the public eye yet she did not cry once according to Sec Jang. However, before they were even anything the thought of having to separate from him made her cry out in front of sec Jang. As soon as she arrived in Cuba, she did go out of the way to look for him scouring the streets like she was going crazy. This is not even the first time for her. From the moment she finds out who he is through him working for her, we are shown that she just can’t stop herself. She’s shown to be jealous of his phone call and proceeds to go to the playground even after insisting to herself and to Mr Nam that it’s not necessary to go there. She is the CEO but we see that from the very beginning he has always had some pull over her. SH has been super crazy about this guy for a while now, even if it wasn’t for the tea lady, she was eventually going to crack somehow and go see him as proven when she went back to the painting and also when she went to go see him after her business meeting when she had already told him she couldn’t make it. 3) how invested he would be in her happiness ie, she would in good hands with him. Mr. Nam who have cared CSH since she was a little kid would impress with KJH's care for CSH from "whether she was truly used to it or was enduring it" and also proven in the explicit action by KJH's exposing himself in the lobby for CSH. I think that's right. SH's father has shown her that he's thinking of her rather than just trying to use her for his own gains, unlike SH's mother. And, SH's father has a reasonable point as well. It's not easy for a normal person to all of a sudden deal with the scrutiny and the negative comments, especially if it starts pulling in and affecting his family. However, JH is level-headed enough that he does understand the risk and is willing to still go for it. I think the time off was really a lack of communication, but one that was driven by concern and consideration, so I'm glad that JH and SH were ultimately able to talk it out. Also, I think the fact that Driver Nam approves of JH should carry some weight with SH's father, since Driver Nam and SH's father go way back to when they were both journalists. I'm happy to see SH's father finally meet JH. They'll get a chance to connect, I think, and gives SH's father a chance to take the measure of JH, and see the man who is making his daughter come alive. I thought that KJH&CSH's time off let them thoroughly consider oneself whether each of them is okay to have no another party in order to exchange with no futher impact/problem from their relationship. Several lovers who face some problem of being a couple and asks to take a break, they might find out that spending life without such problem is happier. Therefore, such time off for some lovers could be permanently broken up. This might be as @shyguitar mentioned above. Actually KJH's dad and CSH's dad are very meaningful to KJH and CSH as their life's advisor. - CSH's dad cares for CSH's happiness. Mr.Nam as a closed friend who CSH's dad can trust Mr.Nam's comments for CSH's happiness. - KJH's dad guides KJH with wise thoughts since KJH was a kid and those words has absorbed to be a part of KJH's thougtfulness and determination. In ep10, when HI showed KJH's dad the magazine as KJH asked her to send but KJH's dad mentioned "KJH's deed might be a part of his job but KJH is lucky to be well recognized" which it could be a fact of any frontdesk's job. Question 1: whether ex-husband would join this meeting or not because the still picture last week, we saw 4 men in CSH's life with smile? Question 2: Plus, KJH will tell his intention about CSH to KJH's dad and what is KJH's reaction? By the way, I have just read the song's lyric KJH will sing for CSH, it looks an implication esp. the end of the song. This may be a mistake. And act uncomfortable around you. That I absolutely have to say. That I have loved you from the start. It is not something I am just saying. Bogum fans in HK giving out free coffee sleeves at Tom N Toms coffee till the 11th of January. Go grab a cup. He knows that she has been lonely all her life. KJH is not like JWS who wants to see how much CSH loves him. JWS needs some action (showing interest) from her in order to see that love which is ridiculous as he doesn't initiate anything. KJH is fine if CSH takes her time to become closer and closer to him. In my opinion, the ending of the episode 9 shows that CSH has changed. Not only she traveled to Sokcho to see him but next to the lighthouse, she is walking towards him. She makes steps in his direction, while in the past (episode 3 and 4), KJH was the one who moved his feet in her direction. From the episode 9, she has become proactive, she is not just standing there. Sure, unlike KJH she doesn't run but there is a huge improvement. From my point of view, CSH will become more offensive with KJH. Me too...I found all the parts with Eng sub except that vid on the PD nim talking earnestly about our OTP's chemistry.....lol. @bebebisous33 I think at some point she’ll give it up. But in exchange she’ll gain more happiness, freedom and a family of her own. their chemistry - i watched other drama kiss scene - i do not watch other drama except boyfriend but when you search #parkbogum in instagram and i really do not understand why other actor/ actress clips are tagging bogum name.. to make it short, i came across their kiss scene because they tag bogum name in ig. and i do not feel anything by watching it / i mean i do not want to rewatch their scene. 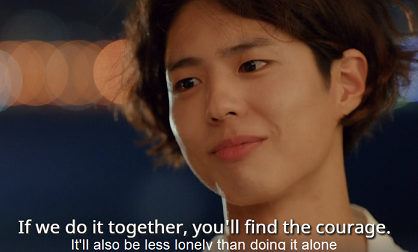 100% agree with you PD nim! that their chemistry is overflowing. even kiss scene, they looks so good. are they nervous ! their leg movement in sync too. This show hasn't disappointed us yet, so I believe that we can continue to believe. Don't worry. Raise my hand to agree with your comment. From stepping back her feet in ep.3 to driving to Sokcho in Ep.9, would audiences be too greedy to wannna watch her gestures to express her love to him first, not just reacting back his? By the way, I remembered a couple persons posted in this forum concerning about CSH's sleeping pill habbit. This sleeping pill point has not been raised from ep.4-ep.9 but our KJH has not forgetten about his beloved CSH. In ep.3, Mr.Nam concerned this sleeping pill and tried to limit the amount CSH will take. In addition to Mr.Nam's care about CSH's happiness, he also concerns CSH's health. In ep.10, during their first video call, KJH who cares about CSH's freedom and happiness, KJH also find the sensible way to suggest about sleeping pill with his concern. Even KJH is younger than CSH but he cares about CSH's health and find the way to suggest, similar good intention as Mr.Nam who is like an uncle to CSH. A nice boyfriend might act with caring like a dad/an uncle to his girlfriend. If Mr.Nam knows about this KJH's sleeping pill suggestion to CSH reflecting his care with all about CSH thoroughly, he must give KJH stronger green light. CSH's dad always ask whether she has eaten, is tired, stays healthy. CSH's dad gave CSH a poem book, as same as KJH gave CSH. Both CSH’s dad and KJH loves reading.